The other day I brought in a flute to play for an activity in Alexander Technique teacher training. Each day that week, my co-trainees and I, we brought in activities. Some of our collective choices of activities were: typing on a computer, bending down to pick up books, shoulder stand (not me hahaha), putting on and taking off shoes, bending down to get a drink of water from the cooler, playing violin… My activities included typing at my co-trainee’s laptop, walking around with my usual bags…my heavy carryall which at times contains my computer, and my purse. And flute playing. 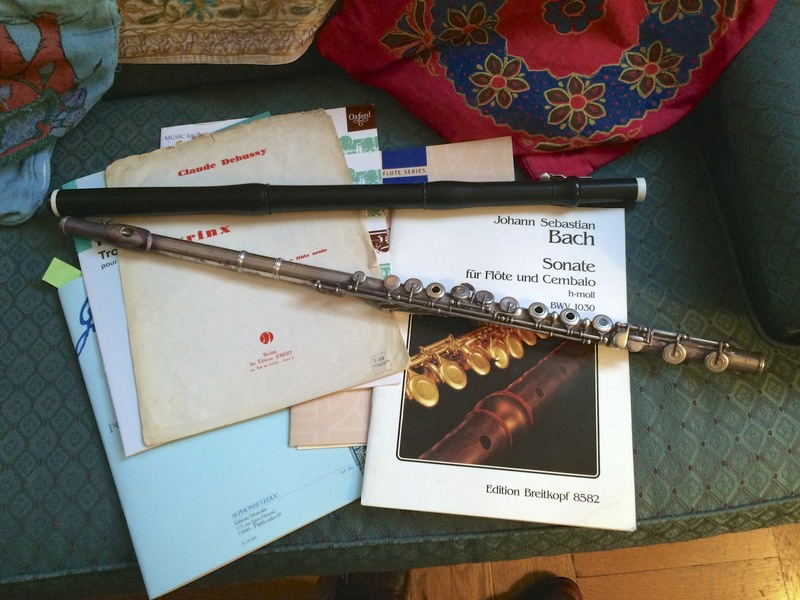 I decided to bring in a flute and to start playing the Bach b minor flute sonata, which I had just started to revisit. I’m playing it differently than I used to. As my training continues, my playing improves, as I am playing with better use of self. I don’t pull down as much as I used to. But this particular activity in the training class was revelatory for me. I think because my understanding of the whole process is improving, and of course, my sensory perception is getting more reliable. I hadn’t realized that I grip in my arms when I pick up a flute. So I must think…hands on back of chair…hands connected to feet…no gripping in the arms…when I pick up a flute and start to play. I tend to shorten my spine as I tend to bring my head toward the music I’m reading as I’m playing. Meh. I hadn’t played in a training class and it was a long time since I played in an Alexander Technique lesson. So I was a tad uncomfortable as my trainer had his hands on me as I was playing. I felt he was impeding my neck, and indeed my whole body from moving, when in fact I was pulling down and I was feeling him counterbalancing that. What should I play for the training activity??? Why the Bach b minor of course! This time around he had nothing to say about my breathing. He used to tell me that I gasped for air. So…as I was playing in French Baroque inégal style, thinking in couplets, making sure my tongue was pointing downwards so that the high notes would come out well, figuring out tonguing…tu ru tu ru tu ru…diddledy diddledy for triplets, breathing well and seamlessly through my nose with my mouth opened, playing musically of course that goes without saying, phrasing nicely, stopping and re-starting when I was not happy with what was coming out, listening to the acoustics in the studio…my trainer was assisting me to stay up, widen, have my neck free. So much was happening all at the same time as I was playing. Mega-multitasking! And…a funny thing…when I was typing…with some hands-on by my trainer…oh…I always type out or hand write out the Ronsard Ode XVII “Mignonne, allons voir si la rose, qui ce matin avoit desclose…” when I am trying out a new fountain pen or computer keyboard…it’s my go-to text…I forgot part of the poem and was weirded out by this. But…my trainer told me something fascinating. He told me that I typed in phrases, with rhythm, as if I were thinking musically. Well I guess I was punctuating out the lines of the poem with my fingers. I guess I always do this when I type out stuff.